1978 Mark Richards Twin fin II 6 ft 1"
1. 'Mark Richards' script and large Lizard graphic, red and white. 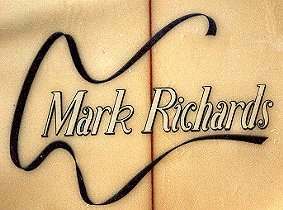 'Mark Richards' script and ribbon graphic, rainbow. Deck: Blue rails, blue/red two tone with yellow foil, with black pinlines ? Sorry, Dustin - all your details went in latest email crash. 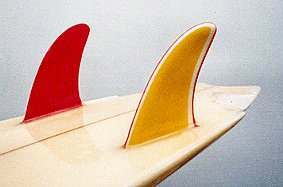 Please contact again when possible - I would like to resize the images..
My 2 MR Twin fins both have initials KF on them. KF is Ken Freeland from South Africa. 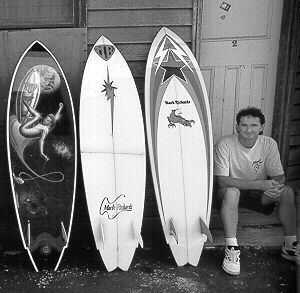 Mark Richards was familiar with the Twin Fin I, see #71 and #106 , (circa 1970 by Mike Eaton / Rolf Arness / Corky Carroll / David Nuuihwa -all USA) and imported to Australia by Tom Hoye (USA) where design had a strong following in Sydney, particularly at Narrabeen) by McCoy Surfboards. Although the design quickly disappeared in Australia, a small following continued in the USA (Steve Lis ) with the development of the Fish. 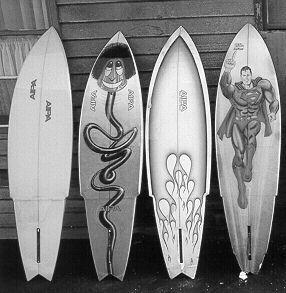 The design was also shaped by Mark Platter, Bob Margettes and Tony Cerff at Maddog Surfboards. Knox: Mark Richards pages 61 on.